How to check mod_rewrite module is enabled using PHP script? But this won't work if you want to check whether Your webserver's mod_rewrite is enabled or not. 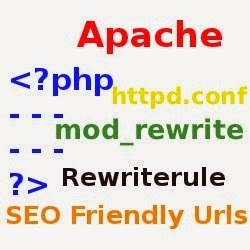 mod_rewrite is not a PHP module , it is an extension of your webserver (Apache / IIS ), So It won't be visible in phpinfo(). In some servers you can see this in Apache info section of listing. It may be visible in the loaded modules section. This article discuss varies tips to check whether the rewrite module is enabled or not and also it give an idea about how to enable it. Point your browser to the folder. If you get a Server Error, it isn't installed. Otherwise it is. Here is the PHP scripts that checks for mod_rewrite on Apache and IIS. If you're using PHP as CGI, above script won't work and it will return an error stating "call to undefined function"
If the above evaulates true, then mod_write is enabled. Using PHP as an Apache module (called mod_php) : the PHP interpreter is then kind of "embedded" inside the Apache process : there is no external PHP process -- which means that Apache and PHP can communicate better. Set an Environment variable "HTTP_MOD_REWRITE"
// Tell PHP that the mod_rewrite module is ENABLED. If the script return TRUE, then Module is enabled. The first line tells Apache to load the mod_rewrite module and the second line enables the use of it. After this you restart your Apache, mod_rewrite should be enabled. Now add changes to your .htaccess file to check whether your rewrite rules are working.